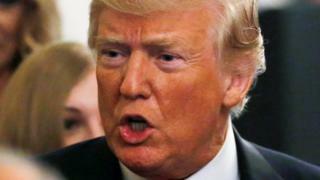 South Africa has accused US President Donald Trump of seeking to sow division after his tweet referring to the "large-scale killing of farmers". He said he had asked his secretary of state to look into the matter of "seizing land from white farmers". South Africa's presidential spokeswoman said Mr Trump was "misinformed". Last month, South Africa said it would go ahead with plans to amend the constitution, allowing land to be expropriated without compensation. Reality Check: Is the South African government seizing farmers' land? Is South Africa’s land reform an election gimmick? The redistribution of land was a fundamental principle of the governing African National Congress (ANC) during its struggle against white-minority rule. But 24 years after apartheid ended, white people - who make up just 9% of the population - own 72% of the farmland held by individuals, according to government figures. Why is President Trump interested? His tweet followed a piece on Fox News about South Africa's planned land reforms - and he tagged Fox News host Tucker Carlson. AfriForum, a group that campaigns for the interests of Afrikaners in South Africa, welcomed Mr Trump's move, saying it believed it had influenced the US president's views. "Trump's announcement follows only three months after AfriForum sent a delegation to the USA to inform the Cato Institute (a prominent American think tank), Tucker Carlson (presenter of Fox News) and various other institutions and politicians of the situation in this regard in South Africa," it said in a statement. The group lobbies globally on the issue, saying South Africa's white farmers feel under attack. In March, Australia's then-home affairs minister said he was exploring giving South Africa's white farmers access to fast-track visas on humanitarian grounds amid fears over the number of farm killings. But South Africa's government said it was ridiculous to suggest white farmers were being persecuted. What is the reaction in South Africa? The official South African government Twitter handle later tweeted: "South Africa totally rejects this narrow perception which only seeks to divide our nation and reminds us of our colonial past." President Cyril Ramaphosa's spokeswoman said the government would "take up the matter through diplomatic channels". Julius Malema, leader of the Economic Freedom Fighters, a radical party which backs the expropriation of land, said South Africans would not be intimidated by Mr Trump and that his remarks had only made them more determined. On the farm killings, he added: "It's absolute rubbish to say there's white genocide. There's black genocide in the USA. They're killing black people in the USA." Many on social media said the US president was not aware of the facts on the ground, with one tweeter poking fun at Mr Trump's apparent ignorance about African countries, when he referred to a country called Nambia last year. No. The constitution has not yet been changed and since 1994 the ANC has been following a willing-buyer willing-seller model to redistribute land. "As South Africans we must move away from this fear psychosis that has been going around, particularly those that have been spreading lies and rumours. Organisations like AfriForum going overseas and saying that the ANC is out for a land grab." Critics of expropriation without compensation have pointed to neighbouring Zimbabwe, which saw some violent attacks on white farmers, alongside the seizure of their land, which has been widely blamed for the the country's economic collapse.